The old adage, "Never let 'em see you sweat" is great advice and should be taken to heart by all - particularly leaders. 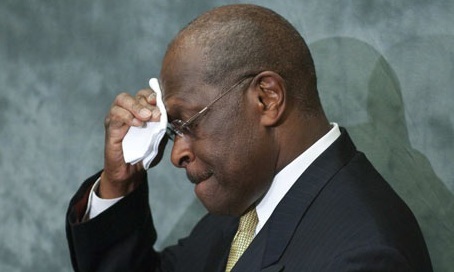 You don't have to be an expert in nonverbal communication to know what Herman Cain is wiping from his brow. What's not so obvious though, is the position and corresponding meaning of Mr. Cain's lips. Here the potential U.S. Republican Presidential candidate shows us a great "Inward Lip Roll" (ILR). The ILR is a very common and reliable body language sign for anxiety. It very often also signals a concerted effort to control a negative emotional crescendo and corresponding display.